You've demanded it and now we're doing it! We're re-releasing the inaugural event in the Winchester Series and you didn't need to make a deal at a crossroads to make it happen! Of course, if you're going to talk about the boys and their "family business", you have to show reverence to the one member of the cast that says everything without speaking a word. "Baby", the '67 Impala. This iconic vehicle has a 327 engine with a four-barrel carburetor and a whole lotta evil-killing weapons in the trunk! Sam and Dean wouldn't kill as many demons or monsters without Baby! 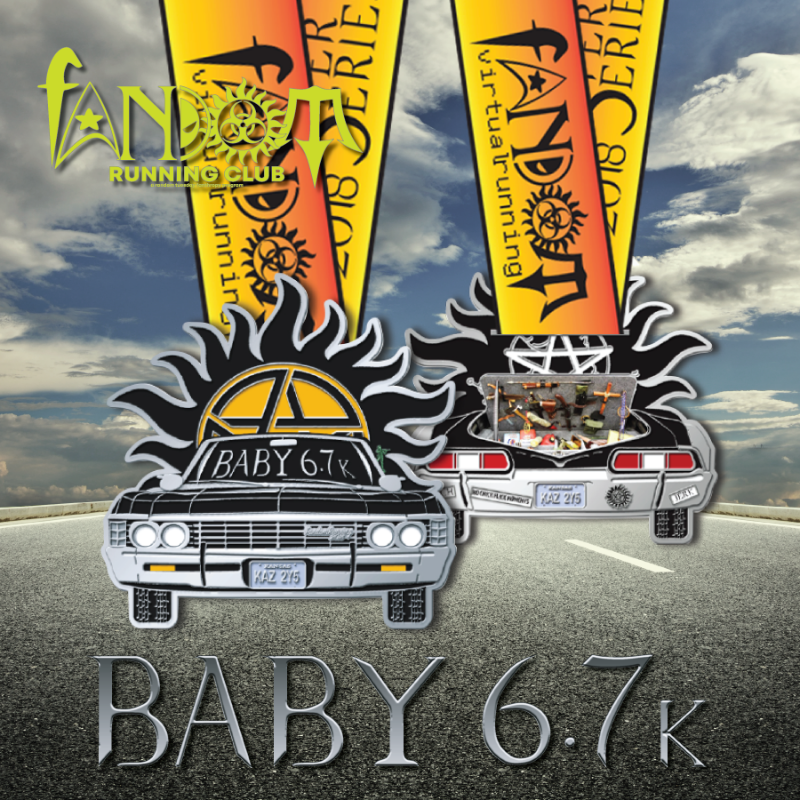 Your registration includes this awesomely large 3.5" two-sided medal, sublimated ribbon, and a personalized digital bib! The medal has tons of "easter eggs" including an Army man and some (ahem) "fun" bumper stickers. Remember, this event is virtual, so you can complete it wherever, however and whenever you want! You can walk, run, skip, bike, or saunter...you can do it in your neighborhood, at the gym, on the treadmill, or on your favorite trail...and you can do it Monday night, Tuesday morning, or Thursday afternoon! It's all up to you! We've got all of the medals in hand, so we'll mail the medals out once a week until all of the available slots are gone. For more information (and to just geek out about your favorite fandom), join our community on Facebook, FRC Fan Domain. If you're not on Facebook, check out the FAQ on our website at www.fandomrunning.org! No Chick Flick Moments...it's time to Run!